This Hopi prayer fills me with gratitude. I continue to learn what it is to live in the “new dawn,” to “take the breath” and allow the prana, the life force of the morning to flow through me. And in those moments, I remember that the universe is synchronistic, and that I am a part of the whole. In those moments, I am healing. 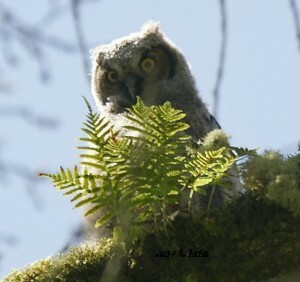 One morning after the sun had risen, my partner and I were gifted to see a Great Horned Owl and an owlet (see accompanying photo). Archetypally a harbinger of visions and dreams, of luminous awareness of ‘tween times, the owl is a messenger of dawn. We’ve sent Owlet to many friends via email and they in turn have shared the photo with others – the owlet a reminder that yes, we are all connected. Over the years, I have found that most people remember and reconnect with themselves in nature, through art and music, in relationship and in spiritual practices. For me, I am most authentically who I am in the moments before dawn. I offer my poem “Lightfastness” both as a poetic reflection and as an invitation to you to rise before the sun and spend some time listening to the earth, to all creation. Take the breath of the new dawn and make it part of you.